I kept the layout really simple, with 10 photos, the numeric title in the top left, offset by a heart, and journaling in the bottom right. 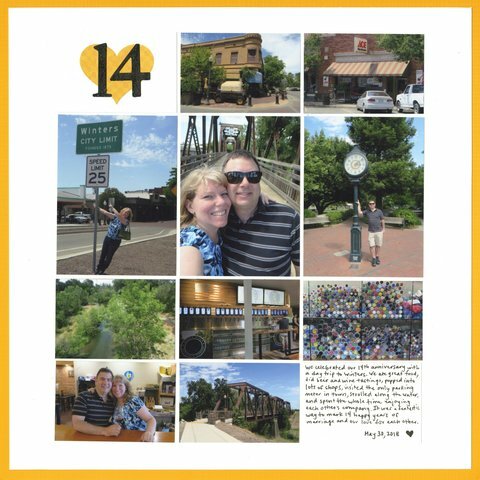 I was really happy with the page... until I slid it into our anniversary album and discovered it very similar to the page I made for our 13th anniversary! As it stands now, the two layouts are side by side. If I end up scrapping photos from the year about the two of us, that layout will go in between the two. If not, 13 and 14 will remain side by side, which is fine. Loveeeeeee this! LOVING the photo of you and the sign! So fun!